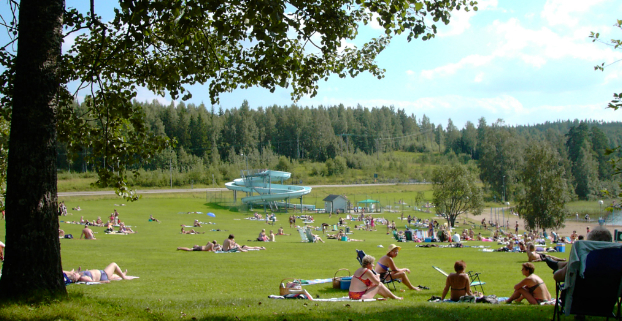 The family-friendly bathing area and campsite lies along route 68, 1.5 km south of Västanfors and 3 km south of Fagersta centre. The campsite, which is beautifully situated by Lake Eskiln, has a fine sandy beach and wonderful grassy areas for play, games and sunbathing. On the shore of the lake, there is a water-chute with heated water in. Water-skiing and fishing are just some of the activities you can do. A fishing license can be obtained from the campsite kiosk. On Tuesdays, angling competitions are arranged along with "quiz walks" along the jogging track from about the 10 May to 1 September. In addition, there is a "put and take" fish pond with farmed salmon trout in it. For the golfers among you, there is an 18-hole golf course 3 km away. The campsite has two mini golf courses where you can challenge the family to a round! You can continue the round in our fully-licensed restaurant. You can go canoeing or take a boat trip on the Strömsholm Canal, canoe hire and tickets can be booked at the campsite. There are excellent places for picking berries and mushrooms close by. In the winter, you can jig-fish through holes in the ice, go cross-country or downhill skiing (6 km to Högsbyn's Alpine Ski Centre). You can book the restaurant for birthdays and staff parties etc. Fagersta offers activites of different kinds and there are lots of interesting sights to see. Here are some examples: salmon fishing in Stora Aborrtjärn, bathing and taking exercise at the sports centre, Fagerstahallen, canoeing on the Strömsholm Canal, rambling on the Bruksleden trail, Västanfors art and craft district, Engelsbergs Mill and the island of Oljeön.